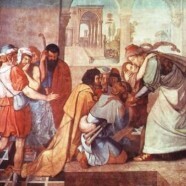 Gen. 44 – The brothers are sent on their way, but Joseph gives his servants special instructions. What are they? (vs. 1-2) After they leave Joseph sends his steward and servants to accost the brothers and accuse them with the theft of his cup. What rash thing do the brother’s promise? (vs. 9,10) Who has the cup? (Benjamin) The brothers are distraught and all rush back to Egypt to beg for mercy. Joseph then makes a curious suggestion to the men. Would most people who had been treated like Joseph by his brothers have forgiven them? Would revenge be a more common reaction? Why is Joseph, though very emotional about seeing his brothers again, able to treat them with kindness and love? The only way this could happen was by the grace of God. Joseph understood that God had a plan for him that in someway included the sins that were committed against him. He refers to this in Gen. 50:20 when his brothers ask for his forgiveness. Read this verse. Ask your children if they have a hard timing forgiving those who have sinned against them. How what does the example of Joseph teach them? (Possible answers: God allows me to suffer in order to teach me something or to use me in some way. Suffering isn’t bad – God uses it in my life and in others for blessing. Knowing that God is in control helps me to be able to forgive. ) Read Hebrews 12:14,15. Why are we to forgive others? Read the parable of the unmerciful servant in Mt. 18:21-35. This story indicates that we must keep on forgiving others because we have been forgiven of our sins by God. To hold a grudge or want revenge is a terrible thing when we realize what God has done for us and He has been merciful. He has loved us and died for us so that we can be forgiven of our sins and have a relationship with God. How dare we be the judge of others when we ourselves have done the same things! If Joseph had held a grudge or taken revenge the whole reason for his experiences – saving his family – would have been for nothing. He saw what his brothers did not – God meant the things that had happened to him had been for good. Is there someone your child needs to forgive in his heart before the Lord? Ask your children to confess to God their unforgiveness and to pray, forgiving those who have sinned against them. Do they have a root of bitterness? Do they need to ask for forgiveness to family members themselves like Joseph’s brothers did in Gen 50? This would be a good time to talk about sibling relationships and to encourage your children to be like Joseph and forgive and to trust God to know what is best for them. Plan ways to treat those who have mistreated them with kindness and love. Do a word study on “forgive” in the New Testament. Find at least 3 passages that talk about forgiveness. Use Matthew 18:21-35 as one. Write down principles that God has laid down about forgiveness that you see from these passages. Evaluate your heart – are you holding a grudge? Forgive that person and then write down a way to serve them to show them love. Then do it! Do you know someone who takes revenge on others when they don’t get their way? Is this a problem in your life? What does the Bible say about revenge? Why is it important to give up taking revenge? Defend your answer from the Bible.